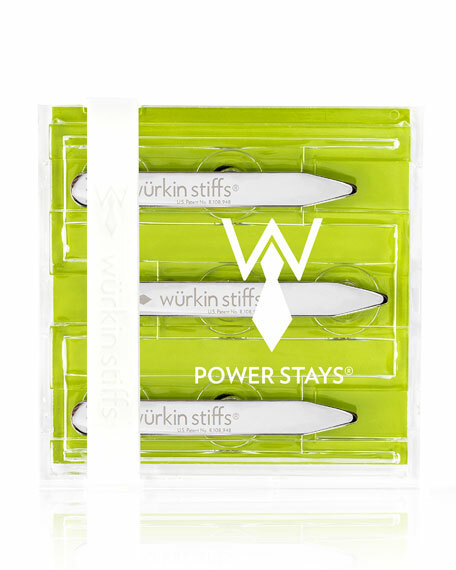 Wurkin Stiffs magnetic Power collar stays in stainless steel. M-Clip polished rhodium-finished money clip with iridescent green abalone inlay. Precision stainless steel heat-tempered spring. Neoprene rubber grip pads. Polished and assembled by hand. 2.3"L x 0.8"W.
M-Clip polished rhodium-finished money clip with Amboyna burl wood inlay. Precision stainless steel heat-tempered spring. Neoprene rubber grip pads. Polished and assembled by hand. 2.3"L x 0.8"W.
Mova Globe historical map that chronicles the voyages of Captain James Cook in the 1790s. Red ecliptic line which shows path of the sun for every day of the year Clear acrylic base provides the illusion of floating. Steel/PVC. 7.75"H x 4.5"W x 4.5"D. Imported. Mova Globe crisp white ocean canvas is laced with clean lines, pencil-sharp details, and slick gold continents that glimmer in the light. Clear acrylic base provides the illusion of floating. Steel/PVC. 7.75"H x 4.5"W x 4.5"D. Imported.